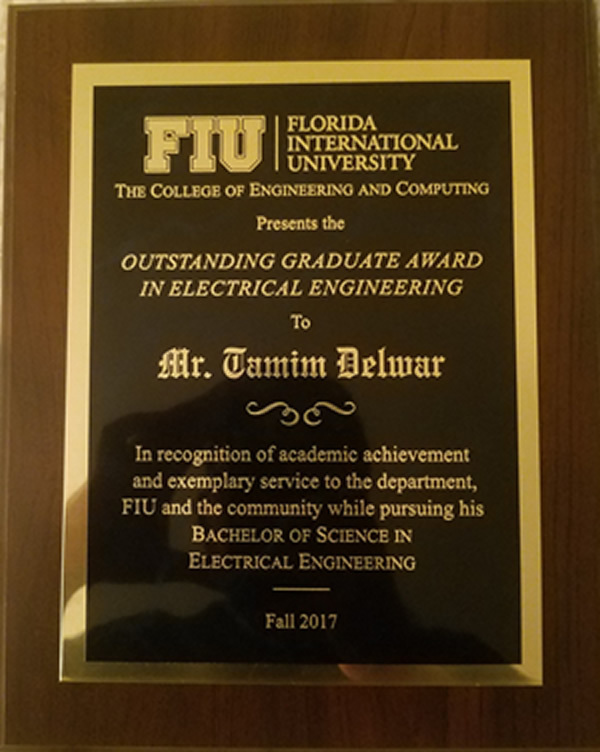 Our Undergraduate Researcher Mr. Tamim Delwar Received Outstanding Graduate Award in Electrical Engineering at the Commencement in December. Tamim is a dreamer. Like many others that we are proud to have as our students. A dreamer, who, like many others, fervently chases his dreams and passionately works to turn them into reality. His hard work allowed him to maintain a perfect 4.0 GPA through his undergraduate education in the electrical and Computer Engineering department of FIU. Considering our rigorous curriculum and our fame as one of 16 universities with the toughest grading system nationally in 2010, this is by itself attest his tireless efforts and talent to be a great, successful engineer. He has not settled with a perfect GPA though. He extended his efforts to contribute to our NSF supported research projects. He contributed to development of visible light communication technology and also developed a UAV based smart agriculture system under the supervision of Dr. Nezih Pala. Tamim has not kept his talents for himself. He was generous to share his knowledge to actively contribute to the community and help his peers. He was an instructor in the Peer-Led Team Learning to teach Physics with calculus to a group of 8-12 college students. He has also been an active member of many honor societies and student associations. We firmly believe that he will continue being a successful engineer, a productive citizen and a graduate that will always make us proud of.